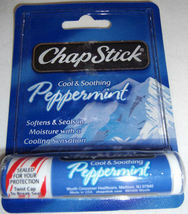 Chapstick Peppermint Lip Balm This listing is for four (4) Chapstick Lip Balm. Cool Soothing Peppermint flavor. Softens and seals in moisture with a cooling sensation. Brand new, never opened or used. From a smoke free home. shipping costs include delivery confirmation. Any questions? Please feel free to ask! Powered by Turbo Lister The free listing tool. List your items fast and easy and manage your active items.